North Carolina Day Care Centers / Child Care Centers – What Standards Apply to Outdoor Learning Environments / Playgrounds? In North Carolina day care centers /child care centers, outdoor learning environments / playgrounds are regulated by the child care rules set forth at the North Carolina Administrative Code Title 10 A – Health and Human Services – Chapter 9 – Day Care Rules. Under Rule 605, Conditions of Outdoor Learning Environments, all outdoor / playground equipment must be in good repair and maintained in a useable condition. The equipment should be sturdy and stable. Inspections and periodic maintenance are important to keep the equipment free from sharp edges, loose nails, splinters, pinch points, and crush points. All broken playground equipment should be removed from the playground or otherwise made inaccessible to the children. Playground areas should be fenced and kept away from bodies of water and other dangerous areas. With proper maintenance of playground equipment and supervision of the children, incidents involving serious personal injuries can be avoided or reduced. 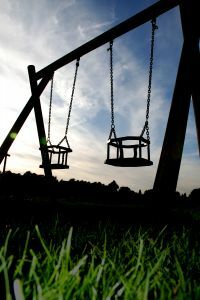 If a child is injured as a result of the negligent maintenance of playground equipment or negligent supervision of children, a parent may be able to pursue an insurance claim or civil case against the day care center / child care center. A North Carolina child personal injury attorney / lawyer can help advise parents as to the myriad of legal issues that arise when a child is injured. Staff ratios requirements are set forth in Rules 712 and 713. Staff ratios regulations are dependent on the number of children cared for in the day care center. Rule 712 covers day care centers with a licensed capacity of less than 30 children. Rule 713 covers day care centers with a licensed capacity of 30 children or more. Parents and caregivers should ask day care operators and owners about the staff ratios and how the facility documents or keeps track of the number of children and staff members on a daily basis. If the day care center is well managed and operated, there should be no problem in explaining or providing you with documentation as to its staff to child ratios. Review the regulations and ask a lot of questions. Having the right number of staff in place is key to preventing or reducing the number of incidents leading to serious child injuries in North Carolina day care centers.